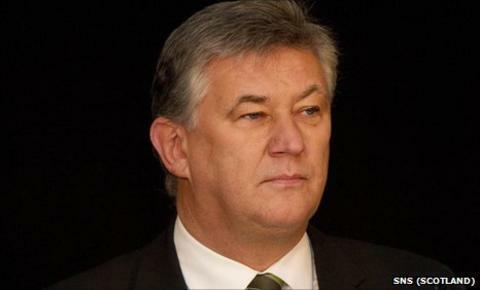 Celtic chief executive Peter Lawwell says he expects a peaceful Europa League tie against Atletico Madrid, despite the clubs' turbulent history. Atletico had three players sent off and seven booked in the 1974 European Cup semi finals and were fined by Uefa. But Lawwell says fans must forget their previous encounter, despite comments in the press by ex-players. "We are in a new era and we enjoy good sporting relations between the clubs," he told the club's website. "We have full respect for Atletico Madrid, the team, and those who manage the club. "A lot has been said about previous meetings between the clubs and we absolutely understand that passions can run very high, but regardless of what has happened historically, we now have a responsibility to ensure that Thursday evening is a celebration of football." Aberdeen fans also experienced problems in November 2007 when they played Atletico in the Uefa Cup. In that instance too, the Spanish club faced Uefa sanctions, but Celtic manager Neil Lennon does not foresee any problems with the Celtic support. "Ever since joining Celtic, it has been an absolute privilege to be in European competition backed by our magnificent support," he said. "We know our fans will want to go to Madrid on Thursday with the intention of enjoying the match in a great European city."